Gallipolis City Commission typically meets the first Tuesday of the month at 6 p.m. in the Gallipolis Municipal Building at 333 Third Avenue in its meeting room that can be accessed from the 2 1/2 Alley. Special meetings are sometimes called and held the third Tuesday of the month at the same time. 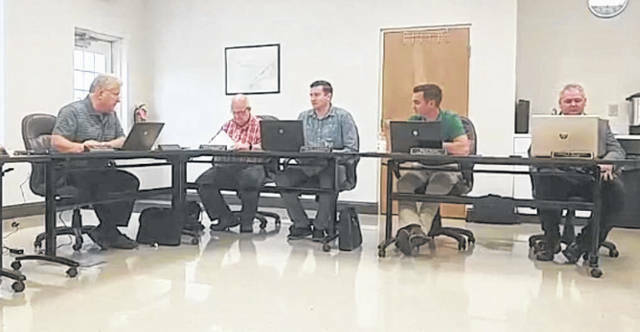 GALLIPOLIS — Gallipolis City Commission gathered for a semiregular meeting Tuesday evening where ongoing concerns with sinkholes were discussed among other topics. The commission’s regular monthly meeting is scheduled the first Tuesday of the month at 6 p.m., but the commission has also been known to hold a second meeting of the month, typically on the third Tuesday at 6 p.m. as well. Greene said the organization could not put a quote on the type of work discussed as it did not seem “feasible” for the desired outcome of detecting sinkholes. Other efforts quoted at roughly $4.50 a lineal foot for close circuit televised inspection could investigate piping but would not reveal whether a sinkhole was above the said line but only what was in the line such as cracks or debris. Should the city maintenance crews invest time in inspecting around five miles of line, Greene said the effort could cost over $100,000. Area engineer and citizen Randy Breech said he had similar experience with what Greene was hearing when Greene asked about construction projects the engineer had worked on in the area. Commissioner Cody Caldwell asked if the city would be able to contact the Army Corps of Engineers. Sang asked if the city could contact the county engineer and if that might put the city in a position to speak with state resources. Greene replied the city could contact any of those previously mentioned but he felt the firms he spoke with that dealt with construction or piping issues “everyday” would have been able to advise an appropriate course of action. He said that was all he had discovered thus far though. Commissioner Stephen Wallis said he had spoken with Meigs County officials about sinkholes and that they had encountered similar issues in the past. The commission took no action apart from discussing a direction for the city to take in order to tackle its sinkhole problem and how to further investigate the issue.